Cedarville’s Tim Stevenson runs in the Division III 400-meter final, Saturday at the state track meet at Jesse Owens Memorial Stadium. Stevenson, who suffered a hamstring injury during Friday’s qualifier, finished ninth. Wooster’s Casey Followay races in the 400-meter race of the wheelchair division, Saturday at Jesse Owens Memorial Stadium. Followay won the 100, 400 and 800 dash. Beavercreek sophomore Ben Ewert runs the 1,600-meter final Saturday at Jesse Owens Memorial Stadium. Ewert missed the podium in the 1,600 but finished eighth in the 3,200 relay to earn a medal. Large crowds gathered to watch the state track competition Friday and Saturday at Ohio State’s Jesse Owens Memorial Stadium. 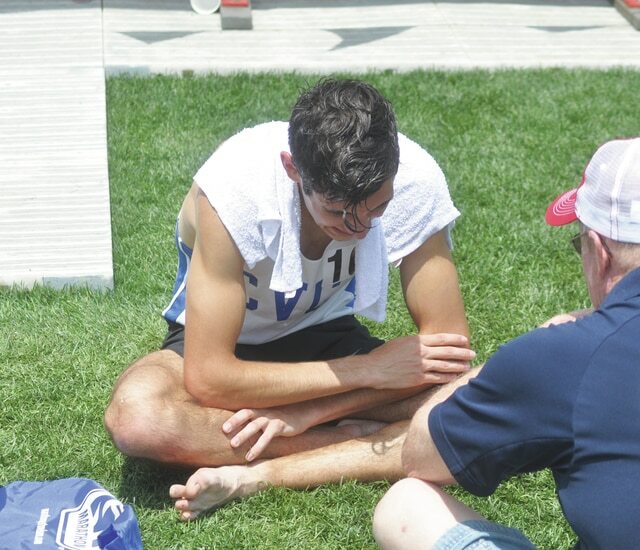 Cuyahoga Valley Christian Academy’s Ryan Adams tries to recover after setting a Division II and state record in the 1,600-meter race, finishing with a time of 4:07.12. It was the longest standing boys track record.